University of Alaska Press, 9781602231849, 295pp. Reaching 20,320 feet into and above the clouds, the peak of Denali is the highest and coldest summit in North America. In this novel of adventure, adversity, and ambition by renowned mountaineer and writer Nicholas O’Connell, four men set out to conquer it. Among the sharply drawn team members is narrator John Walker, a family man trying to choose between domestic stability and mountaineering’s uncertain glory. In the course of their ascent the group battles avalanches, fierce winds, and mind-numbing cold before their bond begins to splinter, leading inexorably to tragedy. Throughout the book, the author’s first-hand experience lends vivid reality to the formidable challenges of the mountain and to the bonds formed and broken in the pursuit of its summit. Beyond the physical tolls, O’Connell presents in stark relief the internal debate about the price of success—all the more urgent at the earth’s extremes. "A powerful and addictive read, The Storms of Denali will sweep you in like an avalanche on the south face of the mountain herself. A vividly written tale about a climb up an unforgiving mountain, O'Connell's novel teaches us what an adventure story is really about—attempting the top is only part of the game; finding one's way home is what makes the true hero." "Seattle climber and author Nicholas O’Connell helps us understand the mountaineer mentality in his debut novel, The Storms of Denali. His neatly crafted tale of four men who tackle North America’s highest peak shows how the combination of adventure and physical risk attracts certain people like a drug." "This book is a page turner. Nick O'Connell clearly knows a great deal about mountain climbing and how to couple this knowledge with a compelling and gripping narrative. 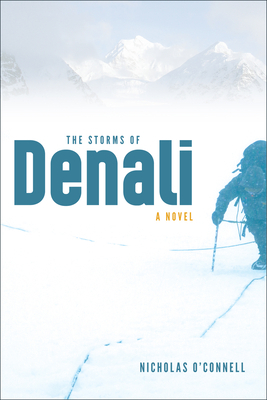 There's plenty of tension and drama in The Storms of Denali. It will be entertaining and engaging for readers even if they don't know much about climbing." "Storms of Denali is a page-turning adventure that leaves readers exhilarated with close calls and hungry for an adventure of their own." "The Storms of Denali will be a great study for those who wish to climb high and a thriller for the 'armchair mountaineer.'" "One of the best Alaska novels in recent years." "Nick O' Connell has portrayed the risks, joys, emotions, and hard labor experienced during the ascent of North America's most frigid mountain. In his novel he displays a full comprehension of these varying experiences and dangers that may be encountered in surviving Denali." "The Storms of Denali is a genuinely engaging novel with not only the suspense and superb pacing we expect from a good adventure story but vividly drawn characters and a fascinating, detailed portrait of the culture of mountain climbers as well. Nick O'Connell's first novel is both a thrilling ride and danged satisfying read." "Nick O’Connell has crafted a remarkable story of risk, death and survival on Denali, the coldest big mountain in the world. Every reader—climber or not—should find this account of a difficult and dangerous ascent both absorbing and mesmerizing. There is a short list of memorable works of fiction about climbing. The Storms of Denali deserves to be among them." "Whether you’re an experienced climber or an armchair mountaineer, you’re going to enjoy the read. Nick’s taken his experience as a mountaineer and his expertise as a writer and delivered a great story, told very well." "The Storms of Denali captures the odd magic created from the hardships, sublime beauty, and pure adventure encountered while climbing Denali. This is a great story, written by an author clearly familiar with the Denali experience. The story tackles some of the calculus that leads climbers and push themselves and risk their very lives in an effort to bring beauty and balance to their existence. Destined to become a classic in North American climbing fiction."